Electoral expert MacDonald Chipenzi has questioned the decision by the Electoral Commission of Zambia (ECZ) to continue printing ballot papers in Dubai. Recently, government announced the ballot papers for the 2021 elections would be printed locally. This message was outright rejected by the main opposition party, UPND, who said such an important task cannot be left for President Lungu to print from his backyard, claiming he would manipulate the poll. But Chipenzi has wondered why ECZ has continued printing the ballot papers from abroad. He stated this in a statement below to Zambian Eye. It is disheartening to observe and hear that ballot paper arrived today from Dubai for the forthcoming local government by-elections. This means that ballot paper printing has continued to be done abroad despite calls by some stakeholders to have them done locally or in nearby countries like South Africa. The continued printing of ballot papers for local government by-elections in Dubai goes contrary to the desire President Edgar Lungu and his government to have these electoral materials done locally to save the meagre resources and is clear display of a blind eye to the financial challenge realities the country is currently going through. It would have been ideal for the Electoral Commission of Zambia (ECZ) to use the local government by-elections to pre-test the local printers’ capacities, competencies and abilities to undertake ballot printing and also build public and stakeholders confidence in the local printers to print the 2021 General Elections ballot papers. The pre-testing of ballot paper printing locally now will help the Commission make an informed decision when the right time comes on whether or not to award the ballot papers printing tender to local printers or not ahead of the 2021. Unless the insistence by President Lungu and his government to have the ballots printed within is just lip-service and mere rhetoric, the continued printing of ballot papers in Dubai by the Commission is uncalled for, at least in as far as local government by-elections are concerned. 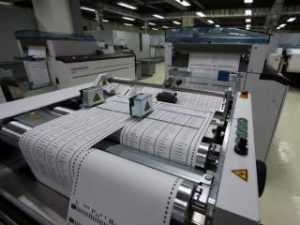 It must be appreciated that those who have opposed the printing of ballot papers from within have not opposed the pre-testing of the “Local Ballot Paper Printing” concept during by-elections but are uncertain about how a serious election like 2021 general elections will be used as a pilot project in terms of ballot paper printing in-country. It is my appeal to the Commission that future parliamentary and local by-elections ballot papers printing should be done locally to ascertain the country and the Commission’s readiness to diligently carry out such an undertaking taking locally for the 2021 general elections. It is extremely interesting and confusing to observe that President Lungu and the Commission are pulling from opposing directions on this matter despite him directing them not to listen to people opposed to “Local Ballot Paper Printing project” by the Government Printers.